What did a Celtic Druid get up to? The mystery and intrigue associated with the ancient Celtic Druid has endured through history to today but the role of the druid in Celtic Religion is not well understood. Throughout the world, there are followers of a druid religion or Druidism who romanticise the druids as environmental or earth priests or priestesses. The connection of this modern druid religion to Celtic history and spirituality is weak. Below I try to answer some of the basic questions regarding druids in Celtic religion. Again I rely on Phyllis G. Jestice's Encyclopedia of Irish Spirituality (2000) for much of the detail. So what is a druid? 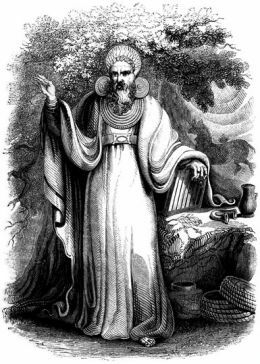 A druid was a kind of priest for the ancient Celts. That much we know. It is also widely accepted that Celtic druids had great influence over kings and did not form a closed caste but one that was open to the upper section of Celtic society. They were privileged members of Celtic society and did not fight in battles or pay taxes. A lot of other details are disputed. What is the meaning of druid? It is believed that the word druid comes from the ancient Indo-European word deru meaning 'steadfast' but is also related to the Celtic word for the sacred tree 'oak'. The root or id part of the word is associated with the word wid meaning 'to know'. So basically druid means 'knowledge or wisdom of the oak'. Because Celtic culture was not a written one, we have to rely on the Romans for a lot of our information about druids. Many different reports tell how Celtic druids acted as priests at rituals and judges in religious matters. They also regulated and performed sacrifices to the gods. They had the ability to curse enemies and were therefore feared. The ancient druids were also responsible for passing on the oral religious tradition to different generations and were regarded as 'teachers of wisdom'. They studied the movement of the stars. 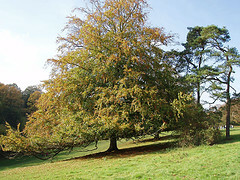 There are accounts of druids eating acorns from the sacred oak tree to give them prophetic powers. Druids were considered masters of stories and poems and as Christianity took hold in Gaelic Ireland, it seems as if there role evolved more as poets with much less religious importance.